My favorite Bobby Kennedy book remains Bobby Kennedy: The Making of a Liberal Icon by Larry Tye, but as a self-diagnosed RFK junkie, this book was pretty good. Jack Newfield definitely has more inside scoop than most Bobby authors, as he was a writer that spent a great deal of time with Bobby during his last several years. His one-on-one conversations with Bobby gave a deeper looking into what he was thinking, particularly during the 1968 race. If you’re a Bobby fan and you’ve read a few books on him, this one is a nice addition as you get glimpses of the man that you really don’t get anywhere else. As one of the most complex, charismatic and controversial figures of our times, Robert Kennedy occupies a remarkable and paradoxical place in the American imagination. On the right he has been idolized by Rudy Giuliani and memorialized by Attorney General John Ashcroft, who renamed the Justice Department after him. On the left, his admirers say he represented the last hope of revitalizing the liberal tradition. But who was Robert Kennedy? 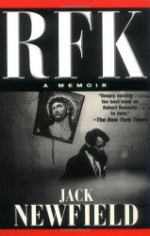 To acclaimed reporter Jack Newfield, who worked closely with him during his last years, RFK was a human being far different from the myths that surrounded his name. “Part of him was soldier, priest, radical, and football coach. But he was none of these. He was a politician. His enemies said he was consumed with selfish ambition, a ruthless opportunist exploiting his brother’s legend. But he was too passionate and too vulnerable ever to be the cool and confident operator his brother was.” In this haunting and memorable portrait we see what kind of man died when Robert Kennedy was shot. And what kind of leader America lost.